I really enjoyed Rick Remender’s Captain America: Castaway in Dimension Z Book One. In fact I have really been looking forward to the second installment. My biggest problem is when I anticipate something usually it falls flat for me. 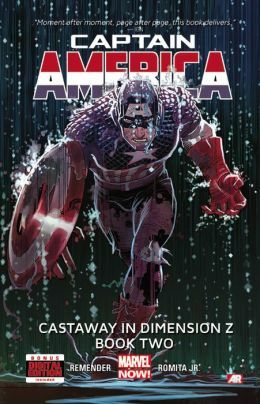 Would Captain America: Castaway in Dimension Z Book Two follow the course of Iron Man 3 and be a personal disappointment? Captain America has been exiled in Dimension Z for over a decade. He attacks Zola’s citadel, Zolandia, to retrieve the only thing that matters to him in this world his adopted son Ian. But Zola is attempting to reprogram his biological son and show him that compassion and mercy are nothing but weakness. In his rescue attempt Rogers confronts Ian’s sister Jet Black who becomes interested in Captain America’s alternative path. With Captain America in Zolandia, Zola puts the final touches of his master plan into motion as he seeks to invade our world. Will Cap be able to beat the villain and if so at what price? Captain America: Castaway in Dimension Z Book Two is an incredibly deep story. First, there is found throughout the collection a reflection on fathers and sons. Can Steve Rogers overcome the legacy of his father who abandoned him as a child? And if he can what will he teach his own son? Or is Ian and Jet trapped to become evil like their father. They were trained to rule, first the Phrox of Dimension Z and then the humans of Earth. But does that mean that their majesty must be dictated by cruelty? In the end three children: Captain America, Jet and Ian, must determine if they or their father’s will groom their personalities. Second, there is an additional reflection of compassion versus force? This is seen most often through the eyes of Jet who has been taught that power equals brutality. She has the right to rule because she has the power to do so. But Captain America shows here that there is another way since he does not dominate the Phrox but chooses to liberate them. You cannot escape the fact that this really fun science fiction romp has some deep material within it. Rogers admits that his father has left a legacy, emotional unavailability. But Ian breaks him out of that trap. Becoming a father is something you can tell that Rogers enjoyed, maybe even more than being a superhero. And his emotional walls had clearly dropped for Ian in ways that that had never dropped even for Sharon Carter. In many ways, like it does for many of us, being a father gave Captain America a new perspective on life. And it could be interesting to watch it play out. My biggest fear since the first volume is that Dimension Z would be undone. Rest assured it has not been, despite claims by Carter that Rogers must have been brainwashed. Dimension Z is a period of Cap’s life, over decade, that will clearly stick with him in the next volumes (okay I have already read the next volume so I know this to be true). Honestly, I am glad that Dimension Z has not just been washed away as a dream. And I really enjoyed the epilogue that shows that no only did Dimension Z leave an impact on Cap, but his legacy includes compassion and freedom as ideals that he taught the Phrox. I really enjoyed Captain America: Castaway in Dimension Z and I find myself more excited about Captain America comics than I have been in years. It may be that now that Captain America has been a father I am more able to relate to him. Or it could just be since I have watched a decade of his life pass by in two volumes I am more invested in him than every before.